Why do I need to focus on improving our systems of care? Gatorounds is a patient-centered rounding system that applies the lessons from UF’s athletic teams and symphony orchestra to health care. Gatorounds is a patient-centered rounding system that applies championship athletic and symphony orchestra principles to health care. We are applying the lessons learned by the University of Florida's music school and premier football, basketball, and volleyball coaches to the care of our patients. 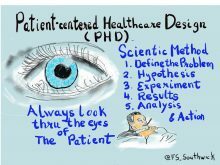 Our approach is also guided by Toyota Production System or Lean adapted to healthcare, called Patient-centered Healthcare Design (PHD). We are applying the scientific method like a PhD to continually improve our rounding system while always looking through the eyes of our patients. A team approach to patient care focusing on the patient as the team owner. Participation of bedside nurses, case manager, and pharmacist in work round management decisions. - Succinct and highly targeted verbal communication protocols that are problem based. - Improved patient flow by planning discharges the night before and having the attending see the patients before work rounds to assure discharge by 10 AM. - Ordering of new tests and procedures etc at the bedside using the portable computer or computer tablet. Patient care means delivering care in the best possible system. If the system fails we appear uncaring Don’t our patients deserve the same standards of quality as our championship athletic teams?